Shiny hair for days. Our weightless radiance refractors outperform silicones and oils. Long-lasting, vibrant color. Our patented Healthy Hair Molecule (OFPMA) combined with long-lasting cuticle sealing technology helps smooth the cuticle and reduce pigment loss. Overnight results that last. These benefits last all week (up to 5 shampoos). 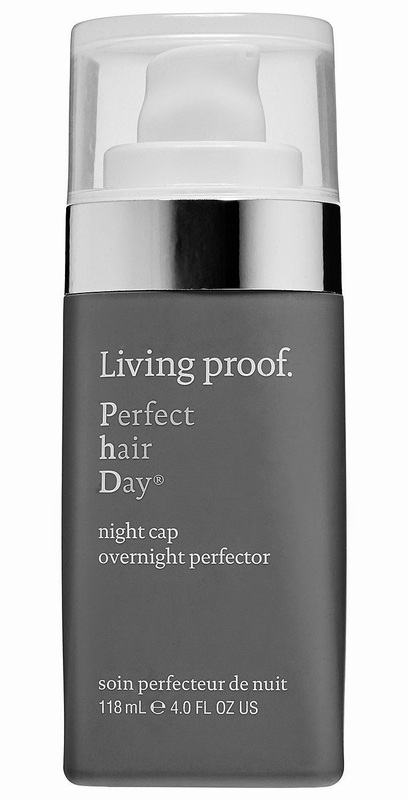 Night Cap is weightless, fast absorbing, pillow-safe, and perfect for all hair types. This is a new product that has launched from Living Proof. The instructions say to use at night before bed. "Apply to damp or dry hair. Start with 2-3 pumps. Spread product between hands. Evenly distribute from root to tip, focusing on ends. Use more depending on hair thickness or length. Comb through and leave on overnight. Style or wash out in the morning." Am I that easy to be sold on a product? A shareholder or owner says it works and all of a sudden "ok, sign me up!"? But sadly, in this case that seems to be it. I have to say I have LOVED the products I have tried from the brand so far. The Perfect Hair Day™ 5-in-1 Styling Treatment is my go to product when I straighten my hair (and a deluxe sample has lasted me IONS), the Instant Texture Mist while not my favourite texturizer is still great, and the Full Conditioner is nice too. So yeah, I guess the brand has proved itself to me thus far and makes me willing to give this product a try.